Build the Millennium Falcon! The famed starship seen in Star Wars: The Last Jedi is making its debut as a 1:144 scale model kit! 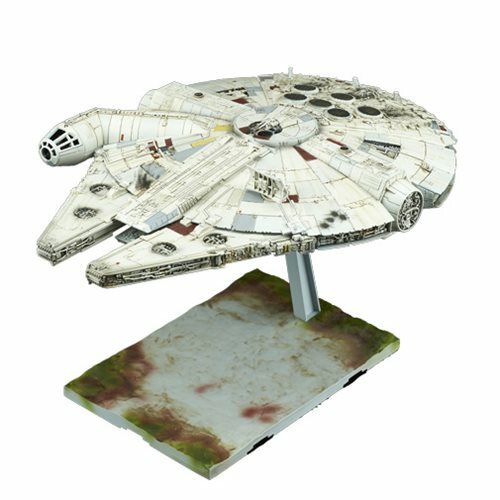 This Star Wars: The Last Jedi Millennium Falcon 1:144 Scale Plastic Model Kit features corrected side walls on the mandibles and new display stand. Extremely fine detailing has been applied to every inch of this kit, and the display base, characters, and added optional effect parts are all done in scale and accurately. A nipper or sprue cutter (sold separately) is required for assembly, but the kit does not require glue. The Star Wars: The Last Jedi Millennium Falcon 1:144 Scale Kit Set includes a dedicated display base, a rear engine effect part, 1:144 scale Chewbacca and Rey figures, 2 canopies (clear and frame), a set of hatch open/close parts, and a landing gear. There are 9 runners, a water transfer decal, a marking sticker, and an instruction manual. Ages 15 and up.